“Sins of the Mother”, begins a new storyline for Oliver Queen that follows the defeat of The Ninth Circle with Emiko kidnapped by her mother Shado. 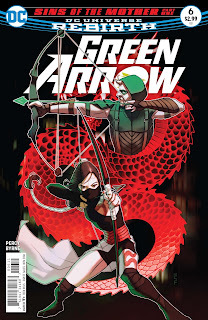 Shado, the female ninja warrior has always played a major role in the comic as love interest and adversary, ever since her first appearance in Green Arrow:The Longbow Hunters. As part of DC’s New 52, in which the title was extensively redone, Emiko is revealed to be the half sister of Green Arrow, the daughter of Shado and his father, Robert. 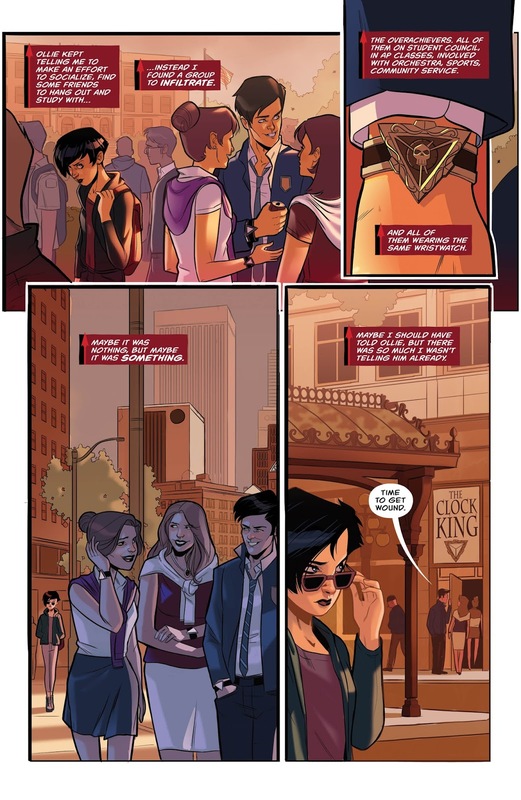 In the end, Emiko chooses to live with Oliver and train as his apprentice. However, in DC’s Rebirth, she joins with her mother Shado in trying to kill him, shooting him with several arrows, right from the rip! Since then, Emiko has expressed guilt and has begun to question her mother’s motives. Issue #5 takes place immediately after the fall of The Ninth Circle. Thus, begins a tale, told through alternating flashbacks from a year before, when she lived with Oliver and present tense, arguing with her mother, Shado about more than a few things. A lot of action in this issue with simultaneous stories starring Emiko, trying to live a normal teenagers life while training and adventuring with Green Arrow. There’s also trouble brewing at school when Emiko spots some of her peers exhibiting some suspicious behavior and some odd wrist-wear. She actively uncovers a plot, hatched by the old Green Arrow villain and new incarnation, Clock King for some trouble of her own. In the present, Emiko confronts her mother Shado about her continued role in the Yakuza and her reluctance to sever those ties to the Japanese criminal organization. Shado is old school, citing honor as motive and a debt owed dating back to her own father’s failure and disgrace, so therefore, Emiko too must atone for sharing the same blood. Emiko refuses and vows to find and kill Oyabun, the head of the Yakuza, doing just that as she works to infiltrate the dark crime syndicate. This is the beginning of another great storyline in Green Arrow lore. Getting to the end leaves the reader anxious to get to the next installment to see what happens next. The artwork is gorgeous , reminiscent of an animated series and nicely stylized. Emiko is becoming an interesting character that has a lot of story potential in the future. 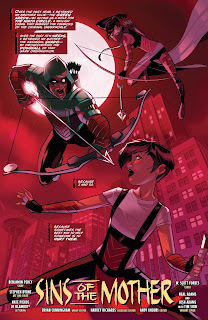 This issue can appeal to both younger readers by Emiko’s past adventure and older fans as well with established characters within the title such as Shado and Clock King. I can see why Green Arrow has become one of DC’s best selling titles with the 1st issue already in reprint. You won’t be disappointed by this one!